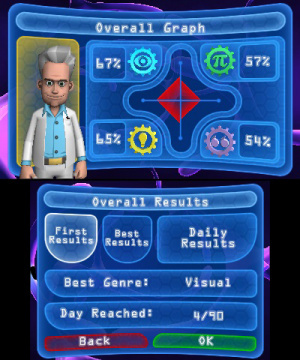 Like Nintendo’s Brain Age series, Puzzler Brain Games is a collection of daily brain training activities designed to stimulate the mind and keep you mentally alert. Though instead of feeling like a curriculum of exercises you’d learn in school, Brain Games is presented in a game show-like format and is a more light-hearted affair overall. We like to think of it as brain candy as opposed to brain food. So the puzzling question is; will this candy leave a bad taste in your mouth or is it something of the sweetest kind? Guess you’ll have to study our review to find out. Anyone that has played Puzzler Mind Gym 3D – a previous entry in the Puzzler series – should know exactly what to expect here. Many of the same exercises have made it over from that game, and while some have been dressed up as something new, there are a few originals exclusive to this version. Think of this as the same game as Mind Gym 3D, but with a slightly different coat of paint and a far more reasonable price tag. So if you’ve already sunk money into the previous edition, there isn’t much of a reason to reinvest in this offering – but you probably already knew that because you’re so smart from playing so darn much Mind Gym 3D, right? The activities here are broken up into four categories; visual, numerical, memory, and word. Each day you’ll be asked to partake in one activity from each of these categories, and then you're scored on your performance. The game keeps track of your progress over the course of 90 days and allows you to compare your day-to-day results to see where you’re excelling and where more work is needed. Completing these tasks on a daily basis only takes about five minutes but if that’s not enough, you’ll be able to advance to the next day’s activities or enter practice mode to keep your skills fresh. Some of these activities are a quick test of your cognitive reflexes while others ask that you slow down and assess a slightly more complex scenario – but don’t misinterpret that, these games are all designed for quick, short bursts of attention. For example, in one activity you’ll find an antsy clown bouncing all over the screen and you’ll have to determine in which hand he is holding his horn. Being that this is a test of a visual nature, it’s a quicker process and more reactive than anything. Thanks to this simple approach, we found this to be one of the most enjoyable and immediately rewarding exercises of the lot. 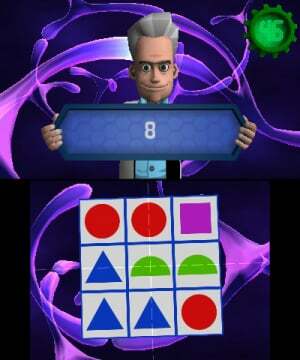 There are a handful of other activities that we found to be genuine fun as well – like counting the number of stacked blocks as quickly as you can, memorizing the locations of rats on an illuminated grid, and finding the last puzzle piece missing from a puzzle – and then there are others that are convoluted and frustrating. One of our least favourite was an activity where you’re presented with up to three scales holding coloured balls of different weights, you need to determine which coloured ball is the heaviest. We’ve seen this similar exercise executed well in other games over the years, but here it’s dull and often deceptive. And that’s another thing; even though you’re provided with brief instructions to introduce you to each activity, they can still be a bit bewildering and many will often require trial-and-error until you figure things out. For the sake of our review we passed off the 3DS to a couple less experienced gamers to see how they fared. 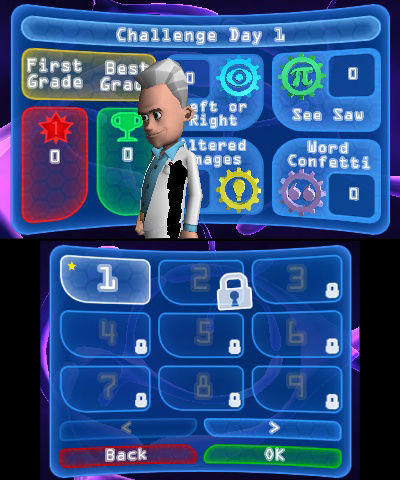 While the majority of their time spent with the game seemed to be enjoyable, there were many puzzles that took a couple sessions to fully grasp, and even then, they still found that finding the correct solution was a bit obtuse when compared to some of the other activities. It’s safe to say that things aren’t always as balanced as they should be. Where the game lets us down the most, however, is in the way it presents our results – or doesn’t. After completing your daily activities you’ll be shown your percentage scores for each individual category, but you’re never provided with an analysis of your progress. There aren’t even any graphs to summarize your long term results. Additionally, it never really explains what it means to be proficient in certain categories but not others. Considering every brain functions differently, we would have liked to know what our particular strengths and weaknesses actually mean. It’s also worth mentioning that there are a few puzzles that suffer from slight detection issues. The first that comes to mind is an exercise that asks you to find the correctly-spelled word floating around a snow globe. Now, this is an activity that we rather enjoy, yet we tallied many wrong answers because the game determined that we were choosing words in close proximity to what we were actually selecting. It’s just a poor design choice on the developer’s part that could have used more fine tuning. None of these issues are game crippling, but they’re definitely annoying when you’re going for a high score. 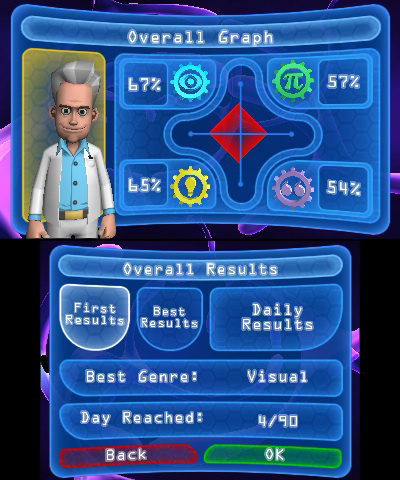 Visually, Brain Games is a satisfactory yet generic affair. You’ll certainly experience many jagged edges and the intro cinematic involving a 3D rollercoaster ride through the mind is nauseatingly bad, due to a choppy frame-rate. The presentation would have benefited from more refinement and diversity, but at the same time it gets the job done. While the 3D provides no gameplay benefits, it’s still surprisingly effective for a budget title. 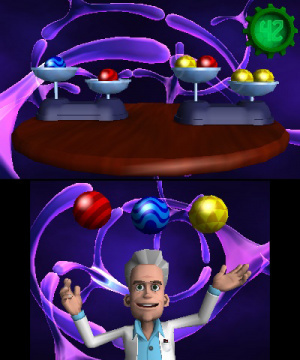 It seems that with a little good, comes an equal amount of bad, making Puzzler Brain Games a bittersweet and average experience. 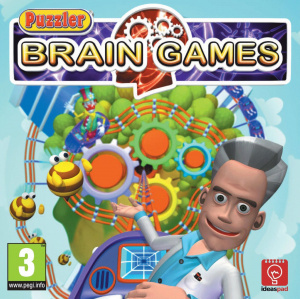 If you’re in dire need of cerebral stimulation for a budget price, then we’re sure you could get some pleasure out of Puzzler Brain Games. However, those looking for the level of quality found in the Brain Age series, or expecting to gain insight into their intellectual shortcomings, should probably steer clear altogether. There are some enjoyable activities here, but due to a handful of stinkers and a lackluster progress tracker there just isn’t enough to guarantee any real lasting power. 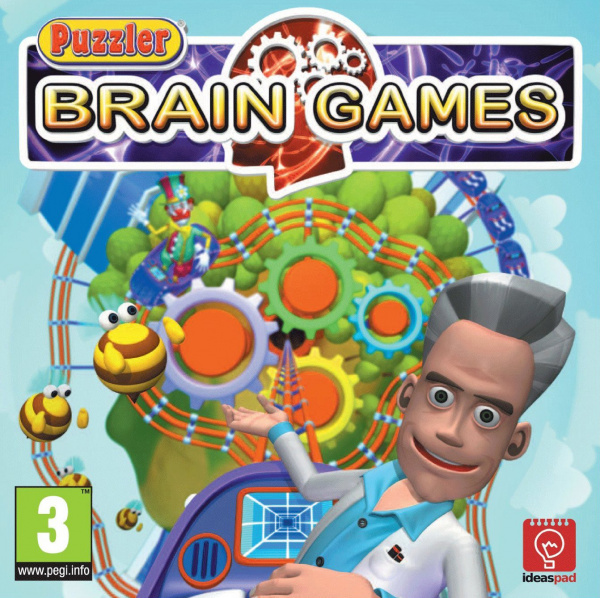 Brain Games means well, it just never puts forth the effort needed to earn marks as high as its classmates. THOSE EYES, no, check that. Anyone else think the professor looks like Steven Karp's dad from Undeclared? Nice review Dave. This game looks utterly repulsive. 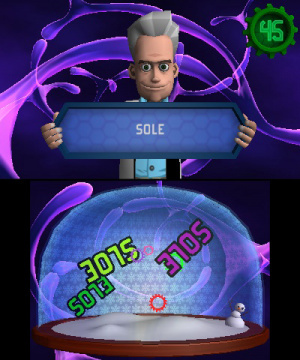 Many of these games have unlockable goodies. Does this one have good unlockables? 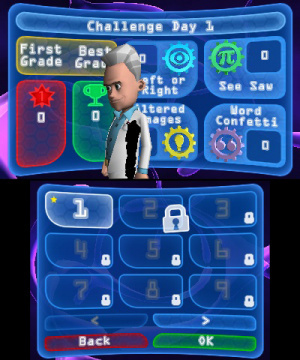 @Eisenbolan When you first start a file I think there are only four puzzles available and you'll unlock up to 20 total as your progress. As far as any other unlockables, I didn't notice any. There are some random educational facts and things to read in the options menu but it seemed to all be available off the bat.